Austria had a fleet in the Ionian sea, which I was able to successfully attack with my fleets in the Aegean and the Eastern Mediterranean. 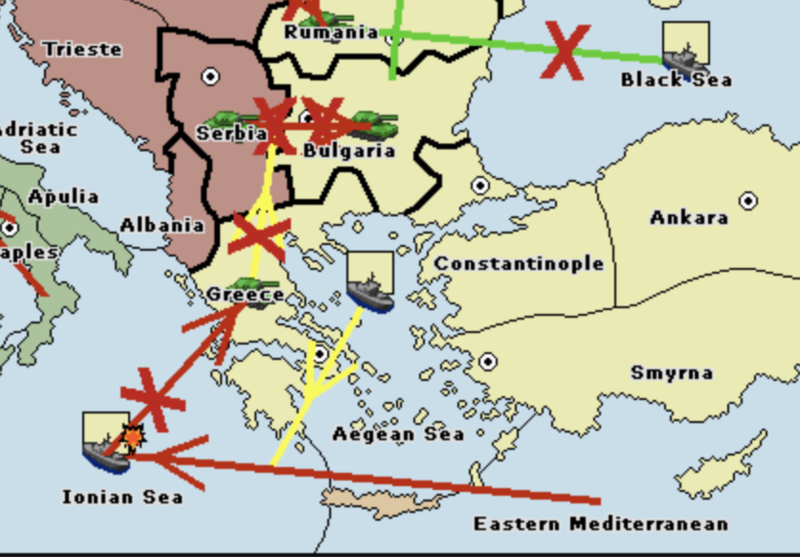 I would have assumed that this attack would have then negated the Austrian fleet's attack on Greece, which would have then been able to support my Bulgarian army's move into Serbia. Unfortunately, this was not the case. Is there a general rule of thumb for how support moves are cut? Getting my head around these 'chain reactions' is proving to be quite difficult, and makes it hard to determine what moves I should make based on what I predict will happen in the next turn! Thanks in advance. It doesn't matter if the attacking unit is ultimately dislodged, it still cuts support. It also looks like maybe you ordered A Rumania to move because your support from Black Sea failed. You can only support a unit that is not ordered to move. Are you allowed to post questions about the game you're in presently? Is it anonymous? It's an anonymous game, yeah. Am I not allowed to post questions about it if that is the case? If so, I'll delete this post or remove my screenshot link, sorry! It doesn't matter whether it's anonymous. If it's a Gunboat though, you're not allowed to discuss it publically. Thanks for the heads up! I'm not even sure what a Gunboat is, so I hopefully I haven't unwittingly stumbled into one without knowing! It is anonymous but we are allowed to talk to each other during most phases. Anything that says "No in-game messaging" is a Gunboat. Technical term..